Every Hans Crouse start going forward is going to be a “must-see” affair. It comes with the territory when you’re the organization’s top pitching prospect at 19 years old and have tossed 11- and 12-strikeout games already. Sometimes he’ll be scintillating, as he was in his last two home games –combining for 23 strikeouts, one run and no walks. But the Northwest League is a developmental league and even the best need to hone their craft. On Tuesday, Crouse wasn’t nearly his sharpest, but the Northwest League All-Star battled through five innings and left with the lead. 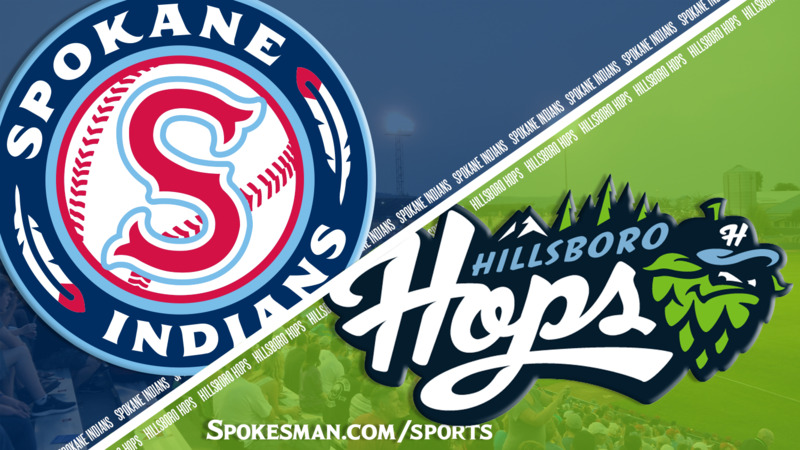 Starling Joseph provided the offense with a two-run home run and the Spokane Indians edged the Hillsboro Hops 2-1 in the finale of a five-game series at Avista Stadium. The Indians (5-3) retain a share of the North Division second-half lead with Vancouver. Crouse (5-1, 2.37) allowed one run on four hits and two walks with six strikeouts. He threw 88 pitches, 56 for strikes. It’s a strong final line for most, but after setting the bar so high it qualifies as a reality check for the young pitcher from Dana Point, California. The quirky righty had struck out 41 over 33 innings in his seven previous starts while handing out just nine free passes and 21 hits. Crouse appeared to have trouble locating his impressive fastball, often falling back on his breaking ball or changeup to find the plate again or pick up swinging strikes. The changeup was a point of emphasis in the game plan. Crouse needed 19 pitches in the first and relied on the change – his third-best pitch – when he had trouble with his fastball precision. He gave up line-drive double to leadoff hitter Jake McCarthy but struck out fellow NWL All-Star Andy Yerzy and coaxed a ground out to short by Joey Rose to end the inning. Crouse went fastball heavy in the second and picked up a pair of strikeouts with the heat in a 1-2-3 inning. Crouse got two quick outs in the third, then McCarthy got to him again for a line-drive single. The Hops center fielder took second when Hasuan Viera couldn’t handle a pickoff throw. He scored on Geraldo Perdomo’s single that stayed just inside the first-base bag. The offense gave Crouse some support in the bottom half. Isaias Quiroz beat out an infield hit to lead off and he went to second on a passed ball. With two down, Joseph launched a high fly ball that just managed to reach the screen above the left-field fence for a 2-1 lead. Crouse made more work for himself in the fourth. Rose smacked a leadoff single and with two down Crouse walked consecutive batters to load the bases. But he battled back to get No. 9 hitter Jorge Perez to fly out to left to end the threat. The fifth was Crouse’s most effective inning, retiring the top of the order in order – ending his evening with a swinging strikeout of Yerzy, the third time Crouse punched him out on the night. Austin Pettibone struck out three in two perfect innings of relief and NWL All-Star Emmanuel Clase earned his league-leading eighth save with a 1-2-3 ninth inning. Published: July 31, 2018, 9:24 p.m. Updated: July 31, 2018, 10:18 p.m.